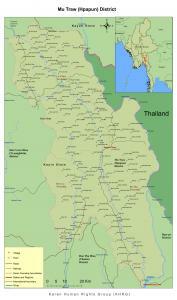 Locally-defined Hpapun District, colloquially-referred to as Mutraw in Karen language, corresponds roughly to the area of northern Kayin State called Hpapun Township on government maps. Hpapun District also incorporates a small part of western Kayah State. It is bordered to the east by the Salween River, which marks its remote border with Thailand. Hpapun Town is the administrative centre of Hpapun Township and headquarters of a Tatmadaw Strategic Operations Command (SOC) of the Southeastern Regional Command. In terms of the seven locally-defined Karen districts, Hpapun is bordered to the southeast by Hpa-an District, the northwest by Toungoo and the west by Nyaunglebin and Thaton. It is divided into three locally-defined townships, which do not appear on government maps: Lu Thaw, Dweh Loh, and Bu Tho. The region’s rugged terrain means that large amounts of internally-displaced populations, particularly in the area north of the Kyaukkyi – Saw Hta vehicle road continue to avoid contact with government troops and KNLA units that are active. This contrasts with southern and central Hpapun, where newly-formed Border Guard battalions control significant territory. The KNLA (Karen National Liberation Army) continues to operate in the contested mixed-control areas of eastern Hpapun District. The terrain is mountainous, comprising of the Hpapun hills. 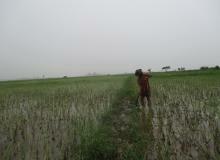 Particularly in northern Hpapun, upland communities practice hill field paddy cultivation on steep mountainsides. The Bilin and Yunzalin Rivers are the major waterways of the district, running north to south through the region. Many communities live along these rivers and their tributaries and depend on them for trade and the transport of goods. The population of Hpapun District consists of a mix of Burman, Shan, Pwo, and Sgaw Karen communities. In the central plains on the eastern banks of the Sittaung River, there are also Burman and Shan villages. Villagers in the mountainous regions of northern Luthaw Township practice hill field paddy cultivation, while villagers in more lowland areas of Dweh Loh and Bu Tho Township practice flat field paddy cultivation or depend on trading cash crops in larger towns. Agricultural production throughout Hpapun District has been severely hampered for more than a decade as a result of attacks on civilians, civilian settlements, and civilian food supplies. Brief history: Tatmadaw access to Lu Thaw Township has been facilitated by a network of unpaved vehicle roads, which it has struggled to maintain in the face of destruction by annual monsoon rains and KNLA attacks. Southern Lu Thaw is bisected by an east-west vehicle road running from Kyauk Kyi Town in Nyaunglebin District to Saw Hta, on the banks of the Salween River. A parallel east-west road runs across Toungoo District to the north, from Toungoo Town to Mawchi, in Karenni State. These roads have been linked by a north-south vehicle road running through western Lu Thaw Township, from Pwa Ghaw to Kler La, on the Toungoo to Mawchi road. These roads are not accessible all-season and are subject to attacks and destruction by the KNLA; sections have become completely impassable and the State Peace and Development Council (SPDC) Army has relied on porters or mule pack trains to transport supplies. Despite limitations, these roads have improved SPDC access and mobility within the area. The army’s enhanced accessibility along the roads threatens the security of civilians residing or seeking to maintain fields in the area. Villages in Hpapun District were attacked and destroyed in the beginning of the major government army offensives of 1997 and 2006. Since the mid-1990’s, thousands of villagers have fled to this area from SPDC offensive operations and deteriorating humanitarian conditions in the adjacent Saw Muh Bplaw, Ler Muh Bplaw, and Kay Bpoo village tracts, as well as villages farther afield. The largest concentration of displaced civilians in Hpapun is found in northern Lu Thaw Township, particularly in the village tracts north of the Kyauk Kyi to Saw Htah vehicle road. A significant displaced population can also be found in other parts of Lu Thaw and in the upland areas of Bu Tho Township, for example in eastern Meh Nyu village tract. Six village tracts are located north of the Kyauk Kyi to Saw Hta vehicle road: Saw Muh Bplaw, Ler Muh Bplaw, Nah Yoh Htah, Kay Bpoo, Gk’leh Der, and Plah Koh. KHRG’s most recent reports suggest that SPDC units are active in all of these areas except Nah Yoh Htah village tract. Throughout 2005 – 2008, thousands of villagers were forced to move to government-selected relocation sites in the lowland areas of Dweh Loh and Bu Thoh townships which were under firmer Tatmadaw control. This resulted in the relocation of a significant population into the upland areas of Bu Tho Township, for example in eastern Meh Nyu village tract. Thousands more villagers attempted to evade forced relocation, and villagers that remained in the upland areas of Lu Thaw Township were subsequently treated as legitimate military targets. In December 2008 the intensity of the offensive was scaled back as coordinated multi-battalion attacks decreased and soldiers withdrew from more than 30 camps across northern Karen State, including 13 camps in Lu Thaw Township. Because of these withdrawals, KHRG dates the end of the coordinated offensive as 2008. More than a year later, withdrawal from forward camps did not significantly reduce the number of troops deployed in northern Karen State and villagers in state-spaces continued to report subjection to exploitative abuses by SPDC Army battalions reliant on them for material support. Since 2008, displaced villagers largely reside in six village tracts located north of the Kyauk Kyi to Saw Hta vehicle road, in Saw Muh Bplaw, Ler Muh Bplaw, Nah Yoh Htah, Kay Bpoo, Gk’leh Der, and Plah Koh, in southwestern Hpapun. Between late 2009 and August 2010, Tatmadaw forces remained active and Democratic Karen Buddhist Army (DKBA) soldiers from Battalions #333 and #999 strengthened their presence in communities along the Bilin to Hpapun Road and along the Bilin River in western Dweh Loh Township. Local villagers reported to KHRG that they continued to face abuse by both actors, although KHRG received a greater number of reports of DKBA abuses, especially regarding exploitative demands, movement restrictions, and the use of landmines in civilian areas. Communities located nearby DKBA camps at the time had their livelihoods further curtailed, as DKBA soldiers enforced strict curfews and other movement restrictions that prevented villagers from spending sufficient time in their fields. The cessation of coordinated and sustained multi-battalion attacks throughout the hills of northern Karen State at the end of 2008 did not alleviate the circumstances that villagers cited as precipitating their flight, namely the SPDC’s offensive presence and activities targeting the physical security and livelihoods of civilian populations in upland areas. In 2009 and 2010, the hardest areas to control with the most displaced villagers in northern Lu Thaw Township continued to exist as free-fire zones in which SPDC soldiers treated all individuals, villages, and food supplies as legitimate military targets. KHRG field researchers reported that in 2009 and 2010, SPDC units deployed in northern Lu Thaw Township continued to fire mortars from their camps, usually from atop hills with commanding views of the surrounding area into suspected hiding sites and agricultural areas. In 2009, KHRG received reports from community members that villages and agricultural lands in Kay Bpoo village tract were destroyed by SPDC patrols in 2009. Kay Bpoo is the northernmost village tract in Lu Thaw Township and, according to KHRG documentation the village/villagers(?) long evaded the targeted attacks of the Tatmadaw. Although the overall SPDC Army troop presence diminished in 2009 and 2010 and certain camps were abandoned in Lu Thaw Township, camps located near large populations of villagers in hiding remained occupied or were rebuilt nearby. In early 2010, one Military Operations Command (MOC) supported by approximately 1,176 troops from ten battalions was operational in Lu Thaw. As recently as March 3rd 2010 camp construction and patrols by recently deployed SPDC units in Saw Muh Bplaw and Ler Muh Bplaw village tracts resulted in 19 households and 102 people becoming displaced. The SPDC presence also prevented the displaced villagers from returning to tend their lands, creating food security concerns and prompting four families to flee to a refugee camp. Between April 2009 and February 2010, central Hpapun District remained heavily militarized and tightly-controlled by Tatmadaw and DKBA forces, which continued efforts to consolidate and entrench military authority over lowland areas by improving military infrastructure, systems of civilian control, and resource extraction. DKBA Gk'saw Wah 'White elephant' Special Battalion #777 has long been active in the northern areas of Dweh Loh and Bu Tho in central Hpapun. Dry weather and other natural factors, such as insect infestation, during the 2010 planting and monsoon seasons severely disrupted agriculture and undermined harvests throughout Hpapun District and other parts of eastern Burma. The harsh conditions exacerbated long-standing pressures on food security, particularly in Lu Thaw Township. In this township land steadily grew more limited and less productive as displaced populations grew, to the point that many households in 2011 had difficulty producing enough rice to feed their families and plant the following year's crop. The situation was aggravated by the fact that communities that were displaced by Tatmadaw operations concentrated in hiding sites and tended to be isolated from established and productive agricultural land. Between January and March 2012, under the control of the Thein Sein government, Light Infantry Division of the Tatmadaw (LID) #22, Infantry Battalion (IB) #8 and #96, based their headquarters at K’Ter Tee army camp in the southern area of Hpapun and joined with the Border Guard Battalion #1013. From K’Ter Tee army camp, they are active from the southwest of Thaw K’Law Kee village to Kyak Thaw Hsay [where Yoh Klah Camp is located] and to the north of M’Taw village, along the right side of the vehicle road. They are also reported to travel back and forth from the east of Nat village to Hsoo Mweh Hta Camp, which is located on the bank of the Salween River. DKBA soldiers from Battalions #333 and #999 occupy more than 28 camps in in Wa Muh, Meh Choh, Ma Lay Ler, and Meh Way village tracts in western Dweh Loh Township. Current Military Situation Tatmadaw and Karen National Liberation Army (KNLA) units are active in Lu Thaw, the northernmost part of Hpapun District. Tatmadaw camps are located along the two main roads, including Leh Klay Koh camp near Saw Hta town. As of March 2012, Tatmadaw Infantry Division (ID) #22, and IB #8 and #96 were reported to have joined Border Guard Battalion #1013 by establishing bases at K’Ter Tee in Dweh Loh Township, as well as reports of increased transportation of rations, weapons, and troops to camps in the border regions. In April 2012, community members working with KHRG reported that there was an increase in Tatmadaw and Border Guard military activity in Bu Tho Township since the January 2012 ceasefire agreement with the Karen National Union. The community member reported more frequent transportation of rations, building materials and weapons, and an increase in troop deployment. In addition, Tatmadaw LIB #341, #434, #340, and #642 established permanent bases by the Hpapun vehicle road, and troops reportedly remain stationed at numerous bases along the Thailand-Burma border. Land confiscation for infrastructure projects and the construction of military bases and plantations is highlighted as a significant issue, and continued natural resource extraction also serves to limit the amount of cultivatable land available. State-led development projects at the village level are also cited as leading to land confiscation as a result of demands for land from government officials involved. A KHRG researcher (?) has provided information on the construction of a new village in Meh Pree Township by a monk in command of approximately 20-30 soldiers. Villagers continue to face demands for food and goods, such as thatch shingles, and demands for forced labour. Significantly, demands for money, or for villagers to serve as soldiers and guides or to perform sentry duty, has reportedly ceased, and there has been a reduction in travel restrictions since January 2012. Some limited landmine clearance is reported to have occurred after villagers discussed the problem with a Tatmadaw officer. Other villagers have adapted to the reduction of suitable farmland by trading livestock and transporting food to sell. Villagers also refused to comply with demands for land in exchange for electricity, and confronted officials over the issue. Current development situation Beginning in January 2011, the The Shwe Poo, Shwe Jya Nar Dar, Yong Nee Oo, and Irrawaddy Htaw Tah, and Htee Phyu Hsin companies have mined for gold along the Baw Loh river in Dweh Loh Township in Hpapun, and according to villagers working with KHRG, these mining projects have led to the destruction of the soil and natural environment in areas owned by villagers, without compensation. Since October 2009, villagers working with KHRG have reported plans by the DKBA to mine for gold along branches of the Bilin River. Villagers also reported that mining operations have already begun at Meh Gkleh, including DKBA officers carrying out using machines to excavate large parts of the river bank and transport excavated sand to Meh Lah in Bilin Township, Thaton District, where the sand is sifted for gold. During 2009 and 2010, a road was built between Meh Lah and the river for the purpose of transporting excavated materials, which according to villagers working with KHRG, resulted in the destruction of irrigation canals vital to villagers' farms and plantations in Wa Muh village tract. Logging In August 2011, villagers working with KHRG reported that the Burma government plans to conduct logging in Bwa Der village and build a dam in the Gkay Doh area. Land confiscation Between January and March 2012, villagers working with KHRG reported that Border Guard Battalion #1013, led by Battalion Commander Bo Lah Kyaing Oo, confiscated the villagers’ cattle grazing land in order to build houses for the soldiers’ wives to live in. In April 2012, KHRG received reports of land confiscation on both sides of the vehicle road from Hpapun city to Way Moo Way Hsa to build Tatmadaw camp after the Tatmadaw LIBs #341, #434, #340, and #642 established permanent bases by the Hpapun vehicle road. Additionally, villagers reported to KHRG that from the November 2010 Burma election until March 2012, they [the Tatmadaw] built one new section in the Traw Day area of Hpapun city. During the same period, villagers reported that land had been confiscated on both sides of the vehicle road from Meh T'Roh to T'Koo Teh to build a battalion camp. Dams and hydroelectricity In April 2012, villagers working with KHRG reported on the planned construction of a dam on the Noh Paw Htee River, which is expected to result in the subsequent flooding of 150 acres of villagers’ farmland, and is valued at US $91,687.